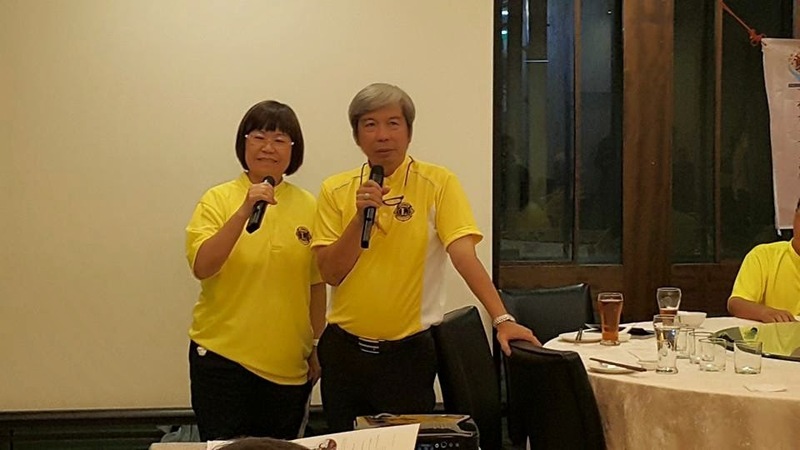 19th April – Final Plenary with the Necrology Ceremony conducted by PCC Patrick Chew and highlight was the announcement for 2015-2016 team. 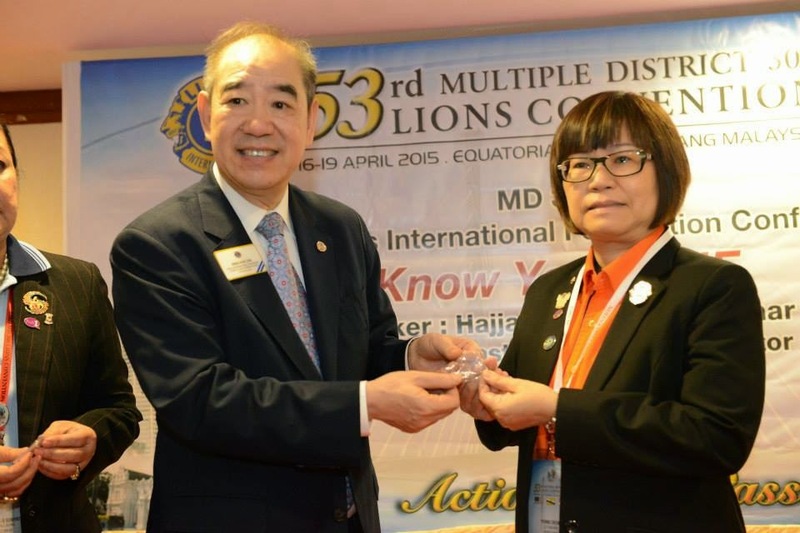 Vice Council Chairman - DG Lim Hoe Guan of 308 B1 Kuala Lumpur. 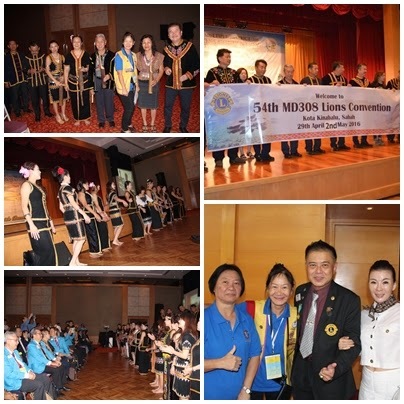 54th MD 308 Convention will be at Sutera Harbour Resort, Kota Kinabalu, Sabah from 29 April to 2nd May 2016 with early bird Registration Fee at RM400. Confirmed registered : President Yvonne, Irene, Lynda, Adelene, Jamie & Jessie. 18th April - School for Key Officers, President Yvonne attended the President School, Jessie attended the Secretary School while Adelene attended the Treasurers’ School. 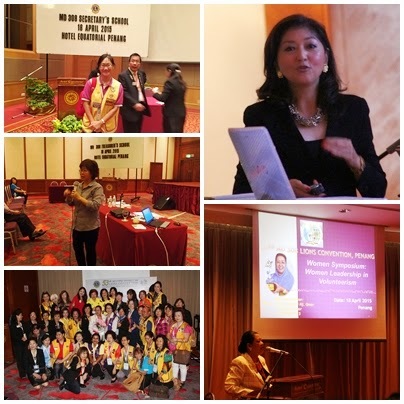 After that, Adelene joined Lynda and Irene for the Image Enhancement by Ms. Josephine Lui and President Yvonne attended the interesting Women Symposium by energetic and vocal PID Hajjah Ellis Suriyati Omar. 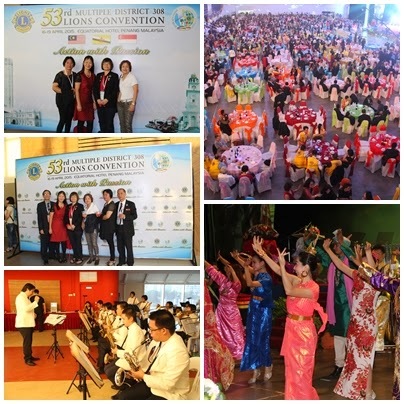 Agenda for Sub-District Convention concluded smoothly presided by DG Ooi Chao Syhuan [the best ever so far] and voting delegates casted their votes before joining the Convention Banquet theme “Action with Passion” at the newly renovated SPICE Arena with 230 colorful tables. 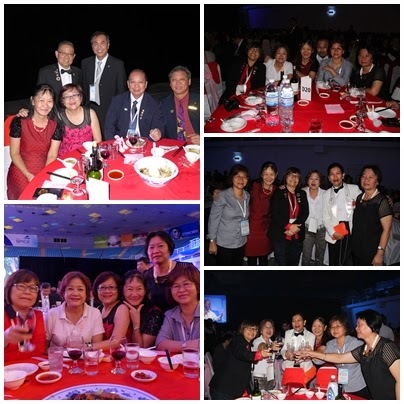 Meet up with old friends and made some new friends at the Banquet and obviously more photo taking. 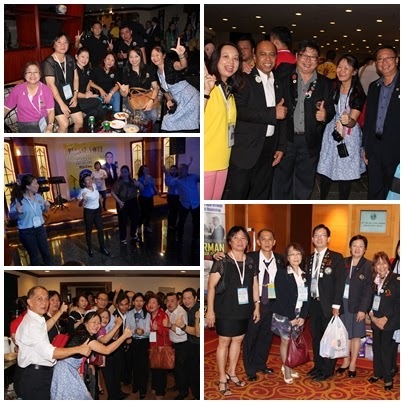 President Yvonne and Irene checked out very early from Georgetown Berjaya Hotel in City Centre to Equatorial Hotel the Convention main hotel, to attend the “Know your LCIF” session at 9 am, whereby all Melvin Jones recipients this year get to receive their MJF Special Pin from Past International President Dr. Wing-Kun Tam. This year President Yvonne became a Progressive Melvin Jones Fellow. 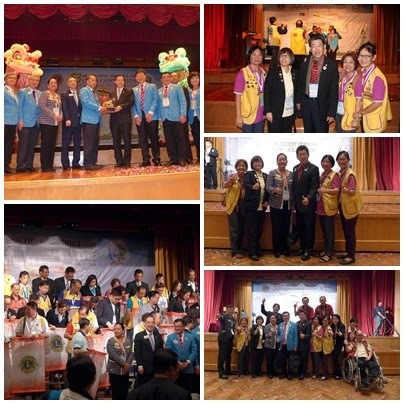 Besides that, three other workshop for the morning program included Centennial Service Program, Hearing Preservation presentation and Youth Camp & Exchange Conference. 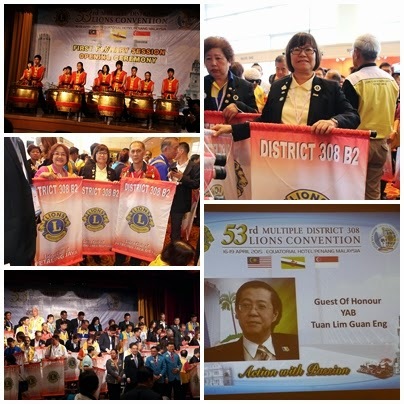 Jessie and Lynda were in time for the MD 308 First Plenary Session & Convention Opening Ceremony which commenced at 12.30 pm. After the MD 308 First Plenary Session. Club representatives were to assemble at the foyer for the Convention Opening Ceremony which includes the Club Banner Presentation. President Yvonne parade with the PJ Mutiara Banner while Irene assisted our 'grandfather club' in holding the LC Petaling Jaya banner for PDG Woon Fong Piew. 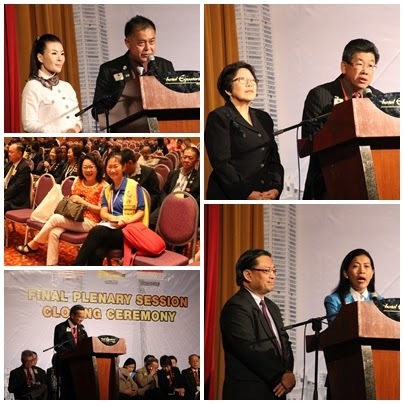 With the limited space for the parading delegates, it was quite a disoriented sight at that moment in time, nonetheless, the event ended in time for the arrival of Guest of Honor, The Right Honourable Chief Minister of Penang Lim Guan Eng, came to give his keynote address. 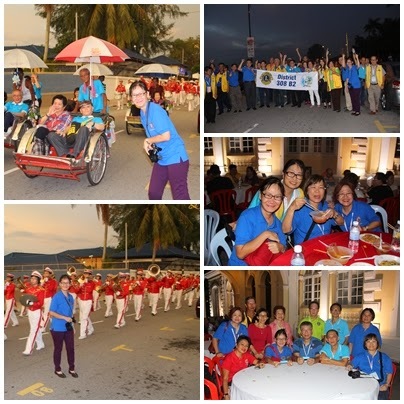 All the official event ended at 4.30 pm and we rested for an hour before getting ready for the Sub District Fellowship Dinner held at the Grand Ballroom with 600 pax. 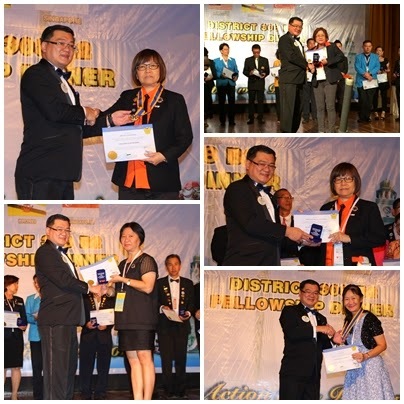 Sub-District Fellowship Dinner was held at the Grand Ballroom as we had the most delegates of all the 4 sub-district, a strong 617 registered delegates. 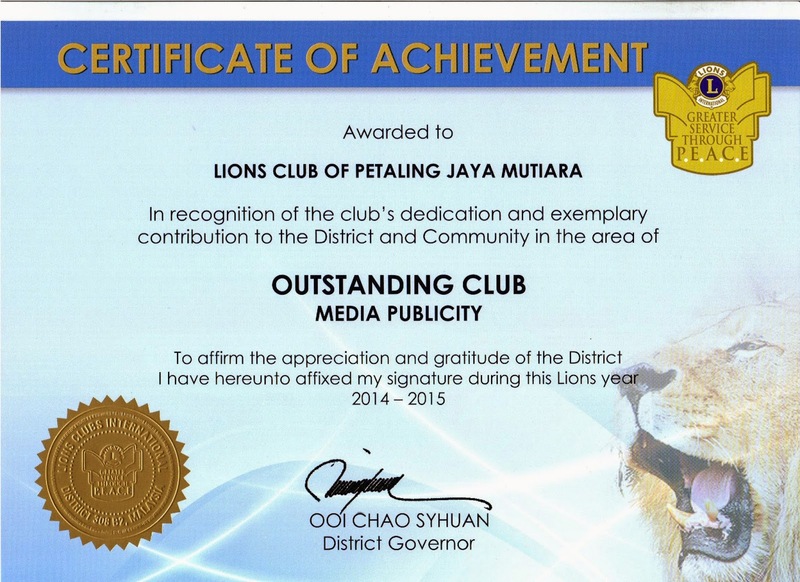 Highlight of the evening was obviously the Awards Presentation by DG Ooi Chao Syhuan. 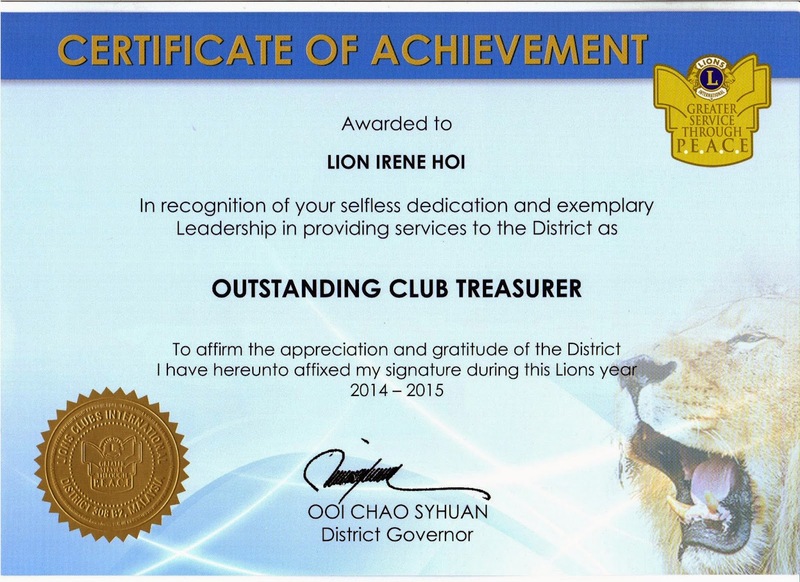 Club collected 11 Awards namely ; Excellent Club, Excellent President Yvonne Cheong, Outstanding Secretary Lynda Yeng, Outstanding Treasurer Irene Hoi, Club Extension, Membership Growth, Women Membership Growth, Outstanding Club Media Publicity, Outstanding Club Major Community Service Project, 100% LCIF Contributing Club and lastly, Excellent Zone Chairman Jessie Ng. Winning the numerous accolades would not have been possible if not for the collectively cooperation, support and teamwork from members of LC PJ Mutiara and Branch Club Petaling Jaya Central, and here we would like to put on record a VOTE OF SINCERE THANKS to all who has one way or another help manifested the energy to achieve to this level. 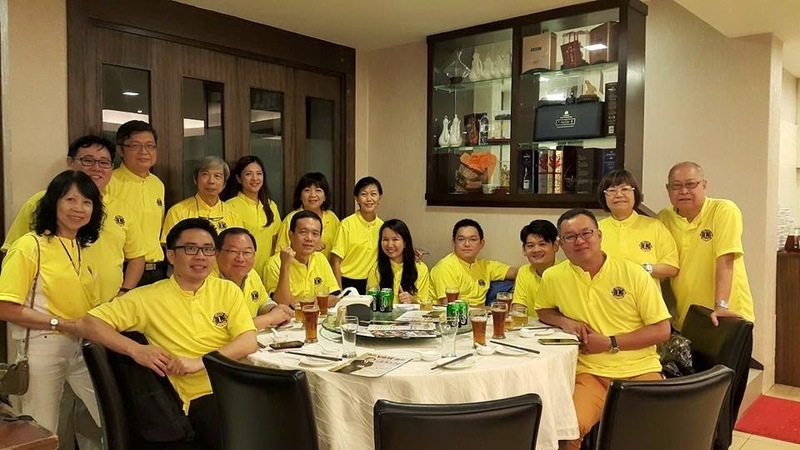 Immediately after the dinner we visited all the Hospitality Reception hosted by DG Elect SN Tai with 1st VG Elect Jennifer Kim, 2nd VDG candidates Douglas Oh, William Lim & James Ong. 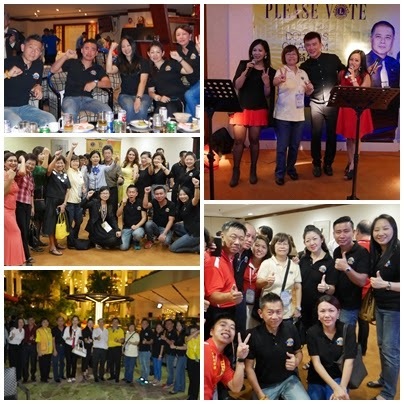 Branch Club members Lion Danny Liew with Anco Lim, Laticia Chong, Mac Soo, Michelle Foong & Tracy Mak also visited some hospitality reception, their maiden Convention feel after being a Lion for 6 months. Attended President Yvonne, Secretary Lynda, Treasurer Irene, IPP Jessie and 10-month member Adelene as registered delegates. 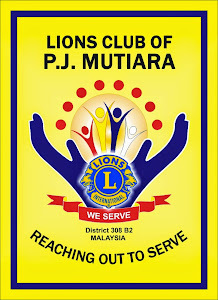 Aside from Lion Adelene, the reminding 4 witnessed the MD 308 Lions Charity Project held at Dewan Sri Pinang Auditorium. 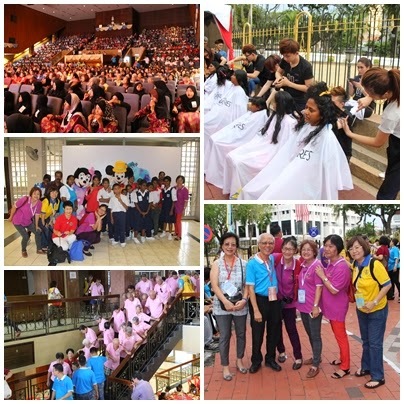 with performances, entertainment, carnival, haircut and dinner for 1,200 senior citizens and children including goody bag to take home. City tour on the Open Tour Bus were arranged for POA’s [Past Officers of the Association] which stops at Clock Tower, the starting point of the Lions Parade to Esplanade led by a school band, some POA on foot, some on trishaw, followed closely by are two chingay flag bearers, eight immortal deities. delegates by from the 4 sub-districts and a lion managed by our very own Penang Lions. 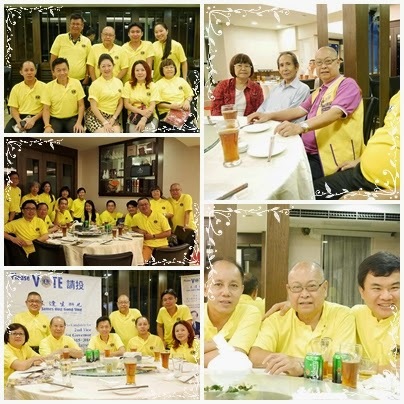 1st April 2015 President Yvonne, PP Nelson with 8 Club Branch members attended the Campaign Fellowship Dinner for Region 5 Lions hosted by 2nd VDG Candidate Lion James Ong Hong Sing held at Duck King Restaurant, Petaling Jaya. 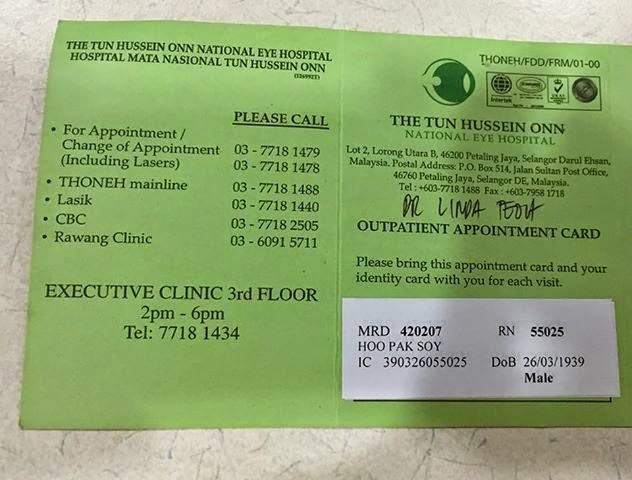 1 April 2015, 76 years uncle Hoo Pak Soy successfully performed his cataract operation at TOHNEH. 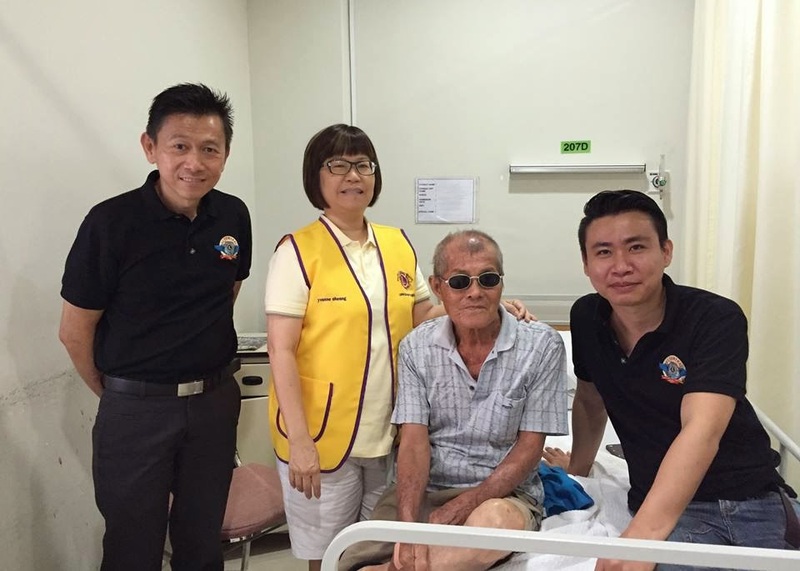 He was received after surgery by President Yvonne with Club Branch members Anco and Mac. Uncle Hoo was shortlisted from our Health Screening Project held at Broga, Semenyih. Out of the 245 people screened, only 6 were detected having cataract and required surgery. However only Uncle Hoo needed subsidy for the operation while the reminding 5 can afford to finance themselves. Wishing Uncle Hoo a speedy recovery.